All family member's Name / Gender / Western Date and Time of Birth (if Lunar must indicate clearly as such). For name western name is fine as this is for Feng Shui and not name analysis. Is there a leak somewhere? 2-3 days (if you require urgently); if not 5-7 days after measurements have been taken. Master Cecil Lee will fix an appointment with you to be on-site to go through a room-by-room explanation. This is a very detailed briefing and often takes more than 2 or more hours. Can we fix an appointment on a Saturday or Sunday? Yes, we are available on Saturdays and Sundays. We can arrange for an audit done on a Saturday or Sunday or even on a Public Holiday. Let us know your preference! Do you use charms or religion in your Feng Shui? Proper Feng Shui is not a religion. And we only use authentic Feng Shui concepts in our practise. Rest assured that NO charms or religion or worshipping are involved in our Feng Shui audit of your home. I have not got my keys yet and when I spoke to my interior designer, they said that you better get your `ideas' cleared before we do the design for your home. Can you help in this case? Yes, Master Cecil Lee can work with you on the layout plan first. Many of our clients have faxed us their home layout plan with the landscape view where the North compass direction marking is stated on the layout plans. For HDB apartments, the North compass direction is stated on the landscape plan. 1. Your new home layout plan with the landscape view (which comes standard with a North compass direction marking). 2. You and your family's date and time of birth. Once Master Cecil Lee has fully analysed your house layout with you and your family's Ba Zi, he will fix an appointment to meet you. This meeting usually lasts around 2 hours or more depending on any additional questions. In this meeting, he will explain to you your Ba Zi, Luck Period significance, binding elements. And also go through detailed room-by-room layout including even the colour, material and positioning of each furniture. Once you get the keys to your proud new home, please arrange for a further appointment with Master Cecil Lee to confirm the readings done earlier from the layout plans. On this visit, if there are any changes (if any), he will follow thru extensively with you. Between the first and second visit, feel free to contact us or fax us the detailed drawings done by your contractor. Master Cecil Lee will often reply on the same day or lastest by one or two working days. I am getting my keys for my new house soon. How can I fix an appointment with you? Master Cecil Lee can arrange to meet you on the same day that you collect the keys to your new home. I bought a resale flat/apartment but have not officially taken over the house keys. How can I arrange for an appointment? 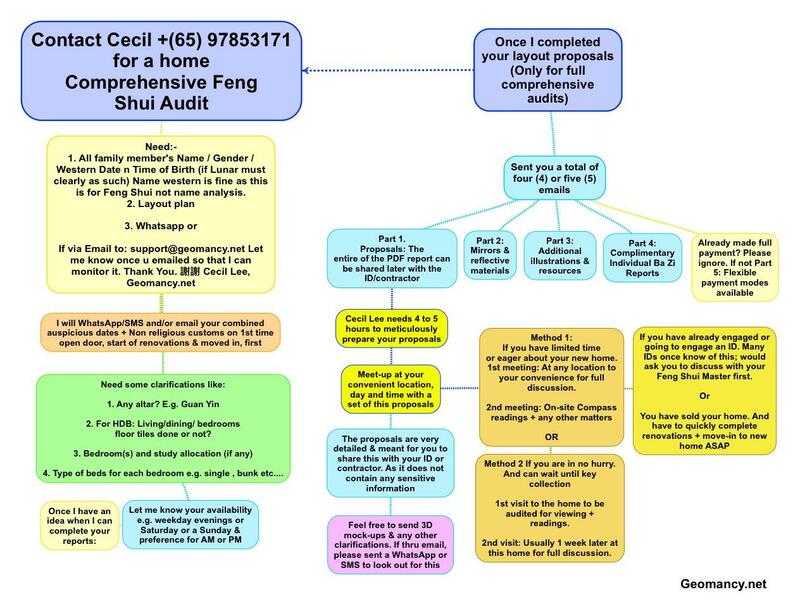 If the existing owner of the apartment agrees to a Feng Shui site inspection, you can contact Master Cecil Lee to conduct the site survey (1st visit). This site survey normally takes around an hour. After the site survey, Master Cecil Lee can then meet up with you for the extensive 2nd visit where he will personally brief you and your spouse. You can request him to pay a further third visit (at additional $100) at your new home once the renovations is completed or nearing completion or after you had moved in for a final check of your home. Do I need to tear down walls? No, a Feng Shui Audit is not so drastic as to ask you to tear down your walls. So far, no client of us has ever been asked to do so. For an existing home, we will work with you to solve problems or make enhancements to enhance better Qi in your home. Which comes first? The Feng Shui Audit or the Interior Decorator's recommendation? In both instances, you get an extensive 2 or more hours briefing on the second visit. It can be longer as it depends on your questions. We always advise our new clients to continue to note down their questions or queries prior to the day of the 2nd visit. On this second visit, Master Cecil Lee will go thru each family member's Ba Zi, Ba Zi luck period and the beneficial binding element of both partners in relation to the Feng Shui audit. You will also know each family member's favourable/unfavourable elements and each family member's wealth element. We will also review your house birth chart and room-by-room. Any questions that you have e.g. the colour scheme, the material and even the layout for each room will be looked at together with him in detail. Can you help me look at the Interior Decorator's Plan after the 2nd visit? Yes. This is totally free. We will work closely with you to confirm the interior decorator's plan. Normally, if you fax it to us, we will get back to you within the same day or the next working day. No. Our prices are affordable and FIXED PRICING i.e. no additional costs involved for the 2 visits. We have a reputation to maintain and will continue to do so. Will you let me know the auspicious date and time for start of renovations and moving in? If you need to check out the auspicious date urgently within the next 30 days. We provided this Free 30-days Auspicious Date for TWO persons for checking out auspicious date for move-in, collection of key etc. For dates beyond the 30-days limit, simply call him up! My fiancee and I will be getting the keys to our new flat soon and we are looking for some Feng Shui advice. I have read through your residential consultation package on the website and it is indeed quite comprehensive. However, i have still some queries regarding the consultation. Q: 1) Is there a 'good' time for us to make the first entry to the new house? If yes, is the selection of the date and time included in the package? Q: 2) Any special practices on our first visit that we should carry out? If yes, is it included in the package? 1. Yes. The package also includes selecting of good auspicious dates. Do let me know both you and your partner's (spouse) date and time of birth i.e. name / gender / date / time of birth. And also which month you are getting your key so that I can prepare the auspicious dates for you to first enter into the new home. 2. Please see attached link showing what to do when you first get your keys. 3. If you are taking leave on a specific day to collect your keys, you check with me earlier to arrange for me to go down on the same day, also. The 1st visit is to take the readings and to do a site survey. During this visit, please furnish a copy of the layout plan and date/time of birth. And any specific needs e.g. the need for a study/work room and/or an altar (if applicable). On 2nd visit is to meet up with both you and your spouse on-site to discuss on the findings inclusive of going thru all family member's ba zi analysis. On the second visit, I will furnish you a proposed layout plan, which was scanned from your layout plan with specific recommendations of bed position /colours. Ba zi and Feng Shui reports will also be provided as an audit trail. Proposed Layout Plan for bed position, furniture placement etc. Summarised Group Analysis Audit Report indicating each individual's favourable / unfavourable and wealth element. Includes how suitable is the house and the crucial binding element especially for both the husband and wife. We will continue to provide after-sales services (additional clarification, auspicious dates for moving in etc) to you at no additional costs. We accept payment by Cheque, Credit Card or Cash payment. For those who do not need a personal site visit by Master Cecil Lee, we have a range of ONLINE HOME CONSULTATION packages only. Should your place your order online, please call (65) 9783-5171 to book a date for your audit. Weekend dates are usually very popular, thus it is on a first-come-first serve basis. So please make advanced booking to secure your appointment.